Brittany, originally independent from, but now a beautiful corner of France, has over 2,800 km of stunning coastline. It is not just the coastline that will leave you awestruck though. There are some fantastic eats too. The Bretons certainly know their food. Here are some of my favourites. Crepes are found all over France, but nowhere are they quite like those found in Brittany. In the South of Brittany crepes de froment are more traditional. These are sweet crepes made with flour, eggs, milk and melted butter. They are often served with nutella, bananas, or strawberries and Chantilly cream. Galettes de Sarrasin are traditionally from Brittany’s North coast. 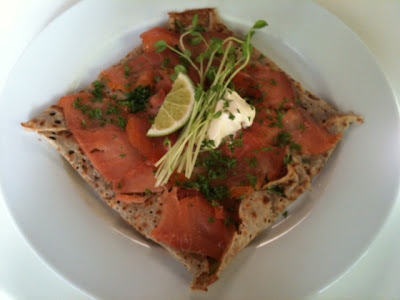 They are savoury pancakes and made with buckwhest flour, often served with ham and cheese or goats cheese and vegetables. My favourite is the Galette Saint Jacques, served with scallops, often on a bed of pureed leeks. Hmmmmm! A trip to Brittany is not complete without trying some of the shellfish. With all of that coastline, you can imagine the variety on offer. Whelks, langoustine, mussels and fish are plentiful here. Keep an eye on the locals during a trip to the beach, you will often see them foraging for some snacks in the rockpools. What would food be without a good drink to wash it all down with? Perhaps coca cola wouldn’t be your first choice to accompany your meal in Brittany, but it is certainly a refreshing drink to try at some point during your visit. Breizh Cola is marketed as ‘The Cola of Brittany’ It is bottled by Phare Ouest and is a locally available alternative to Coca-cola. It can be interpreted as an effort to maintain the Breton identity, but is definitely the first regional French cola. This is truly the jewel in Brittany’s tasty treat crown. To give you a clue, the words in the name are the Breton words for ‘cake’ and ‘butter’. It is a round crusty cake made using thin layers of bread dough, sprinkled with sugar and some have crème patisserie inbetween layers too. Kouign Amman is a simple but an amazingly tasty dish. So there, you have it, some of my favourite eats in Brittany. How French women manage to stay slim is beyond me!